Alexander Macdonnell, a Belfast doctor, became a vigorous supporter of slave-owning planters in the West Indies and, in 1824, published an account of the condition of slaves in Demerara [see Links]. He produced evidence from three doctors, all of them Scots (Drs Watt, Bell and Mackay), who painted a glowing picture of the care given to sick slaves. The harsh reality of plantation life is, however, apparent in their admission that deaths exceeded births. Their evidence also revealed that the position of a doctor on the slave-plantations was attractive. They received a fixed fee per slave and some earned more than £1200 (over £85,000 at today’s prices). 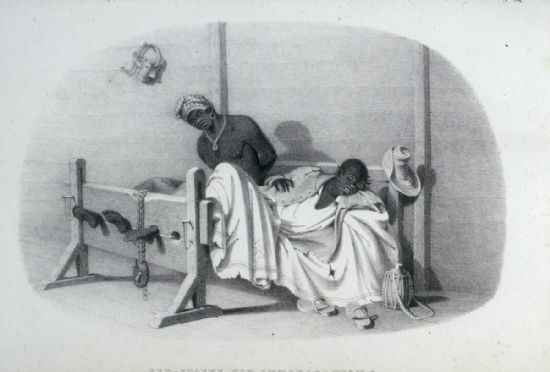 There were additional payments for treatment of the white owners, managers and overseers – and many doctors bought slaves themselves as an investment. Highland doctors included Dr Gordon of Carrol, Dr William Munro, Dr William Macbeath, Dr Noble, Dr Murdoch Dallas, Dr Alexander Rose, Dr George Bethune, Dr John Macintosh and Dr Colin Chisholm. It is seldom acknowledged that the effectiveness of Scotland’s universities in training doctors depended not just on positions for them at home and in the military – but also on the slave plantations. Plantation 'hospitals' often doubled as punishment cells. Alexander Macdonnell is sometimes regarded as the first world chess champion, although the title has not been invented at the time. He played most effectively with Black. Alexander Rose [a surgeon from Caithness, who had practiced in Dundee, died of yellow fever in Berbice in 1802 [Scots Magazine]. His will was registered in Edinburgh in 1804 by his widow, Anne Sime [CC8/8/135]. He was the son or John Rose, sheriff-clerk of Caithness. Archibald Johnston, surgeon (son of John Johnston, writer in Bathgate) died in Berbice in November 1806 [Scots Magazine]. Peter Fairbairn described him as 'a respectable medical practitioner' and related how, in 1804, he had been horse-whipped by his wife's uncle, a Mr Barry. Dr William Gordon subsequently fought a duel with Barry. [NAS GD46/17/26]. In 1817 his heirs owned plantation Retreat (of Lot 14) on the west sea coast, with 64 slaves [Slave returns]. His wife, Elizabeth Jane Barry, later married Hector Downie [London Gazette, 1827]. Dr Johnston's daughter, Margaret, died in Berbice in 1820 [Edinburgh Magazine] and his son, Archibald, was, in 1844, confined in a lunatic asylum in Aberdeen [Will of Hector Downie, PROB 11, Piece 2008: Vol. 18, Quire Numbers 851-900 (1844)]. Dr Alexander Macalister from Glasnakille in Skye, came to Demerara c1815 where, in 1819, he married Catherine Mewburn. The couple had at least four sons and later emigrated to Gippsland, Victoria, where his son Alexander was the first resident doctor [Gippsland Times]. Dr James Robinson from Banff was the brother of Mrs Rose of Montcoffer. He died in Demerara in December 1808 [Scots Magazine March 1809]. James Sharpe or Sharp, was a military surgeon in the 16th Regiment, born in Moray in 1781. He served in Surinam from 1804 to 1816 and was later transferred to Demerara where he died in 1825. An account of his life was later published in Timehri: the journal of the Royal Agricultural and Commercial Society of British Guiana, 1921. For family tree see Sharpe (Ancestry) - subscription required.